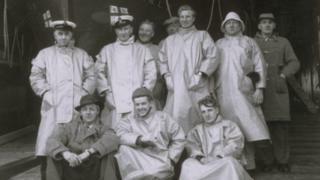 The eight men who died in the Longhope lifeboat disaster have been an inspiration for 50 years, according to John Budge. “I was only 18 then so they were an example for us to live by,” says Mr Budge, who himself served as a lifeboat crew member for 39 years and is the current station manager at Brims, the Orkney station where the boat was based. “On a personal note, their strength has helped me through my adult life,” he said. The Longhope lifeboat TGB capsized on 17 March, 1969, after setting out late in the evening from Hoy in Orkney, to help the Liberian cargo ship Irene, which was adrift in a fierce storm. The TGB, a 47ft (14m) Watson-class lifeboat constructed of wood, set off in conditions of near-zero visibility. A Force 9 gale, coupled with a spring tide, led to waves 60ft (18m) high. The lifeboat is believed to have been overturned by a freak wave, possibly 100ft (30.5m) high. The lifeboat was found at 13.40 the following day by Thurso’s lifeboat. No-one on board survived. When the boat was recovered, the bodies of all but one of the crew were inside the hull. The coxswain was still at the helm. The body of James Swanson was never found. 21:15 – Irene grounds – reached by Coastguard teams. 21:28- Last radio signal from TGB. 21:30 – TGB is seen north of Pentland Skerries Lighthouse by the principal lighthouse keeper. 21:35 – Keeper sees TGB’s stern light about a mile away to the east. 22: 00 – TGB fails to respond to a radio message. 01:30 – All Irene’s crew safely brought ashore. 01:40 – Thurso lifeboat crew locate upturned hull of TGB, four miles SW of Tor Ness. Towed to Scrabster Harbour by Thurso lifeboat. Angus Heddle and Geordie Taylor both helped launch TGB on its final shout. Angus said: “Watching the boat going out the bay Malcolm McKay and me was the last two to leave the shed and we were stood in the lee of the shed. “We stood there until we could see no more. We went home and listened on the radio. Geordie said: “In the morning there was still nothing. About lunchtime it came over that the boat had been found upside down. “It just floored the whole island. You just couldn’t believe it. “They’d been out on many a wild night and always came back. After it initially happened everybody seemed to muck together and the boys got another lifeboat. Assistant Mechanic James ‘Jimmie’ Swanson (59). His body was never found. On 22 May 1970, the Hilton Briggs became operational on Hoy with a new crew. An inquiry into the loss of TGB found that all necessary precautions and procedures had been taken by RNLI and the Coastguard. The inquiry stated that TGB had capsized after being overwhelmed by “very high seas and maelstrom conditions”. The loss of TGB led to the development of self-righting lifeboats. John Budge said he has often thought of the men who set out on the Longhope lifeboat 50 years ago. “The first times that we launched from Brims after the boat went back into the slip I can remember me passing under the roof beam and looking at the roof beam and thinking that was the last part of home those men saw, going under that beam, and I used to shudder went I went down there,” he said.